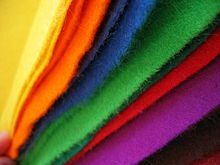 a felt hat フェルト帽, 中折れ帽. feel a patient's pulse 患者の脈をとる. Feel my cold hands. 私の冷たい手に触ってごらん. Just feel the weight of this jewel. ちょっと手に持ってこの宝石がどれだけ重いかみてごらん. 〔+wh.〕〈…かを〉触れて知る 《★【用法】 通例 whether，if，how の節がくる》. Feel how cold my hands are. 私の手がどんなに冷たいか触ってごらん. Feel whether it's hot. それが熱いかどうか触ってみてごらん. 〔+目的語(+副詞(句))〕[feel one's way で] 手探りで進む; 慎重に事を進める. He felt his way to the door in the dark. 暗がりの中で彼は手探りでドアまで行った. I feel a sharp pain in my chest. 胸に鋭い痛みがある. I can't feel my fingers. (寒さなどで)指の感覚がなくなっている. 〔+目的語+原形〕〈…が〉〈…するのを〉感じる，感触する 《★【用法】 受身では to 不定詞を用いる》. I felt my heart beat violently. 心臓が激しく鼓動するのを感じた. I (can) feel something crawling up my leg. 何かが脚をはい上がっているのがわかる. He felt himself lifted up. 彼は体が持ち上げられるのを感じた. I don't feel much pity for her. 彼女をあまりかわいそうだとは思わない. What do they feel toward you? 彼らはあなたにどんな感情を持っていますか. He felt her impatience. 彼は彼女のいらだちに気づいた. She felt anger rise in her heart. 彼女は心に怒りがこみあげるのを感じた. He felt his interest in her growing [fading]. 彼は彼女への関心がつのって[薄れて]くるのを感じた. I could feel her disappointment. 彼女ががっかりしているのが感じられた. I felt the truth of his words. 彼の言葉は本当だろうと思われた. I feel that some disaster is impending. 何か災難が迫っているような予感がする. I don't feel that it's a very good plan. それがあまりよい計画とは思わない. I feel it my duty to speak frankly to you. あなたに率直にお話しするのが義務だと感じています. I don't feel it necessary to go. 行く必要はないように思える. The report was felt to be untrue. その報道は真実でないように思われた. He felt himself called upon to offer his help. 彼は何か手伝いをしなければならないと感じた. I began to feel the weight of his argument. 私は彼の議論の重みを悟り始めた. She feels the cold badly in winter. 彼女は冬の寒さがひどくこたえる. I felt her death [insult] keenly. 彼女の死を強く悲しんだ[侮辱に強く憤った]. Industry was quick to feel the effects of the energy crisis. 産業はいち早くエネルギー危機の影響を受けた. The ship is still feeling her helm. 船はまだ舵(かじ)がきいている. feel good 気分がいい, 元気がよい; よかったと思う. He felt sorry for her. 彼は彼女が気の毒だと思った. He felt bad [badly] about the remark. 彼はその言葉を気にした. I feel down [up] today. 《主に米国で用いられる》 きょうは気がめいっている[気分がいい]. I felt disgusted. 胸が悪くなった, 愛想が尽きた. He felt a new man. 彼は生まれ変わった[さわやかになった]感じがした. She felt in charge of the situation. 彼女はその場を取り仕切っているように感じた. How are you feeling [How do you feel] this morning? けさはご気分はいかがですか. 〔+like+(代)名詞〕〈人が〉〔…のように〕感じる (cf. FEEL like… 【成句】 (1)). He felt like a fool. 彼はばかだなあと感じた. 〔+as if〕〈人が〉〈(まるで)…のような〉気がする 《★as if の代わりに as though，また 《口語》 では like も用いる; cf. FEEL like… 【成句】 (5)》. He felt as if he were [was] stepping back into the past. 彼はまるで過去の世界に踏み戻っていくような感じだった 《★【用法】 as if 節 中で 《口語》 では直説法が用いられることが多い》. Your hands feel cold (against my skin). あなたの手は(肌に)冷たく感じられる. The fork felt heavy. そのフォークは重く感じた. This paper feels like silk. この紙は絹のような手触りだ. It feels good to be wanted. 人に求められることは気分がよい. How does it feel to have passed the examination? 試験に合格するとどんな気分だろう. 〔+as if〕〈物事が〉〈(まるで)…のように〉感じられる，〈…と〉思われる 《★as if の代わりに as though，また 《口語》 では like も用いる; cf. FEEL like… 【成句】 (5)》. It feels as if it were [is] the fur of a fox. それはまるでキツネの毛皮のように感じられる 《★【用法】 《口語》 では直説法が用いられることが多い》. She feels for [with] me. 彼女は私に同情してくれている. He feels for all who suffer. 彼は苦しんでいる人にはだれにも哀れみの心を向ける. feel strongly about equal rights for women 男女同権についてはっきりした考えをもっている. How do you feel about (going for) a walk? 散歩(に出るの)はどうですか. How do you feel toward your father now? 今はおとうさんのことをどう思っているのですか. I felt in my pocket for the key. ポケットに手を入れてキーを捜した. He felt around [about] for the handle. 彼は手探りで取っ手を捜しまわった. My fingers have stopped feeling. 指の感覚がなくなっていた. It has a rough feel. 手触りがざらざらする. Let me have a feel (of it). (それに)触らせてください. There was a feel of frost that night. その夜は霜の気配があった. The room has a homey feel about it. 部屋にはくつろいだ雰囲気がある. have a feel for words 言葉に対する勘がある. From Middle English felt, from 古期英語 felt, from Proto-Germanic *feltaz (compare Dutch vilt, German Filz, Danish filt, French feutre), from Proto-Indo-European *pilto, *pilso 'felt' (compare Latin pilleus (“felt”) (adj. ), Old Church Slavonic плъсть (plŭstĭ), Albanian plis, Ancient Greek πῖλος (pîlos)), from *pel- 'to beat'. More at anvil. It were a delicate stratagem to shoe A troop of horse with felt. (obsolete) A skin or hide; a fell; a pelt. (transitive) To make into felt, or a feltlike substance; to cause to adhere and mat together. (transitive) To cover with, or as if with, felt. (transitive)(poker) To cause a player to lose all their chips. 古期英語 fēled, corresponding to feel +‎ -ed. Conversions to Islam can therefore be a deeply felt aesthetic experience that rarely occurs in Christian accounts of conversion, which are generally the source rather than the result of a Christian experience of beauty.